Riparian habitats have been frequently identified as priority areas for conservation under climate change because they span climatic gradients and have cool, moist microclimates relative to surrounding areas. They are therefore expected to act as dispersal corridors for climate-induced species range shifts and to provide microclimatic refugia from warming. Despite recognition of these values, rigorous methods to identify which riparian areas are most likely to facilitate range shifts and provide refugia are currently lacking. We completed a novel analysis across the Pacific Northwest, USA, that identifies potential riparian corridors featuring characteristics expected to enhance their ability to facilitate range shifts and provide refugia. Maintaining and restoring ecological connectivity is a primary conservation need and the most frequently recommended climate adaptation strategy for biodiversity conservation. However, little guidance exists regarding where and how to connect fragmented habitats to facilitate climate-driven shifts in species ranges, or how to anticipate and address climate impacts to existing habitat linkages. This project helps address that need by engaging science-management partnerships to inform the decision-making of land and wildlife managers tasked with maintaining connected, resilient ecosystems in the transboundary region of British Columbia and Washington State. This research aims to understand how the landscape and climate influence sage grouse habitat suitability and population viability in eastern Washington. Researchers are using genetic sampling techniques and occurrence data to model landscape permeability to movement and gene flow for sage grouse in the study area, and then applying those models to understand how landscape and climate change might affect the population in the future. Meadows play a critical role in creating a resilient forest ecosystem, acting as ‘islands’ rich in diversity and rare species that are dispersed within the forest matrix. Meadows are important for wildlife, providing resources for food gathering, nesting, and courtship displays. Wet meadows also provide important ecosystem services including filtering sediment, mitigating extreme flood events, and helping to recharge groundwater. The goal of this project is to develop remotely sensed and modeled data that can allow us to assess observed trends in meadows over the last three decades, and based on past dynamics, make projections of future trends using climate change projections. Our methodology leverages the USGS Landsat satellite archive (1984 – present) to create time series detailing seasonal and long-term changes for individual meadows. We use this rich dataset to understand historical changes such as tree encroachment, to understand changes in meadow greenness, and to make meadow-specific projections under climate change. The marbled murrelet is an endangered seabird that forages in coastal waters from Alaska to California. The foraging and nesting success of murrelets is highly sensitive to climate influences on the marine and terrestrial environment. Researchers from state and federal agencies in Washington, Oregon, and California are modeling the influence of climate variability in the Pacific Ocean on the marine food web in coastal waters and then seeking to understand how these changes in foraging conditions are driving trends in at-sea abundance and distribution of marbled murrelets. Local adaptations driven by genetic selection over time make it possible for tree species to inhabit broad climate envelopes. In our rapidly changing climate, however, the slow process of natural selection and gene flow may not keep pace and therefore create a mismatch between the near-future climate and local adaptations in the population today. 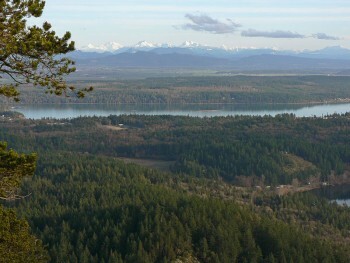 The goal of this project is to map genetic adaptations to climate in the genomes of Douglas-fir (Pseudotsuga menziesii) and Fremont Cottonwood (Populus fremontii), map the spatial range of these local adaptations, and model the ability of these adaptations to move through the population over time in a changing climate. Climate projections indicate an increase in flooding in many Pacific Northwest watersheds over the course of the 21st century, in response to an increasing proportion of mountain precipitation falling as rain instead of snow. Global climate models also project an increase in the intensity in the type of heavy rain events that cause most river-scale flood events. In this study, we used new projections to model changes in future streamflow and evaluate potential changes in peak flows on the Snoqualmie, South Fork (SF) Skykomish, and Green rivers. Most studies of future flood risk have focused on quantifying the amount of sea level rise, or the increase in streamflow during flood events, and have stop short of evaluating which areas are flooded and at what depth. The few studies that have modeled the extent and depth of future flooding (e.g., Hamman et al., 2016; Mauger and Lee, 2014) are limited in spatial coverage and are not easily comparable due to differences in the data and methods used. The purpose of this project was to pilot a new inexpensive approach to developing a consistent set of flood projections over a much larger area by quantifying changes in the depth and extent of flooding for all but the uppermost reaches of the Snohomish and Stillaguamish watersheds. Dynamically downscaled projections – in which Regional Climate Models (RCMs) are used to simulate local scale changes in climate – are still relatively rare, especially at the scales needed to assess changes in stormwater risk. The primary aim of this project is to produce two new RCM simulations and deliver post-processed model projections that are tailored to the needs of stormwater modeling and planning. In addition, this project explores the possibility of using the RCM simulations to identify statistical relationships between large-scale weather conditions and local variations in extreme precipitation. In the Puget Sound region, climate change is altering the water cycle and water resource conditions, and the most disruptive effects are linked to extreme events such as low summer streamflow conditions and winter floods. Competing water uses will become increasingly important in the face of extreme events. Planning for extreme flooding events in coastal floodplains and estuaries will become more challenging with increased intensities of extreme rain events and shifts in run-off timing. This project addresses the most important water use issues for ecosystem sustainability and human resource needs. Through extensive stakeholder engagement and the development of critical water resource metrics and measures of fish habitat and human use, this project leverages existing climate, hydrological and coastal model simulations to develop a visualization-based decision-support tool to support water resource planning for extreme events. This research will map climate-forest snow interactions across the Pacific Northwest, predicting how forest change is likely to affect snow duration in different locations and testing those predictions against careful observations from field sites and a network of citizen scientists. Results from this project will help managers to act strategically to maximize snow retention (protecting forests in some areas while opening gaps in others), providing more water later in the season for hydropower, agriculture, and fish flows. To improve the simulation of future extreme storms and their effect on precipitation and runoff production over complex topography in the PNW and Intermountain West, researchers applied regional climate model (RCM) simulations for streamflow projections over the PNW. The RCM provides explicit, physically based simulations of seasonality, size, location, and intensity of historical and future extreme storms, including atmospheric rivers. Results show substantial increases in future flood risk in many PNW river basins in the early fall. Water temperature, a main driver of ecological processes in streams and rivers, is projected to warm throughout the Pacific Northwest as a result of climate change, further stressing the freshwater biota. For 30 large rivers throughout the lower portion of the NPLCC domain, remotely sensed spatially continuous maximum water temperature data will be used to map the location of cold water patches, identify the landscape and hydroclimatic drivers of cold water patches in the rivers, and determine how detection of cold water patches in the rivers depends on the spatial resolution of the water temperature data. During late summer, glacial meltwater is an essential component of the water budget of the Skagit River as it provides cold flows that are critical for endangered fish species after runoff from snowpack has subsided. Glacier inventories in the Pacific Northwest have shown dramatic changes in glaciers over the 20th century, and additional warming is expected to further reduce glacial mass and meltwater in the Skagit River basin. The purpose of this study is to provide Seattle City Light with a model component of the Distributed Hydrology Soil Vegetation Model (DHSVM) that can simulate the effects of climate on glacier mass and meltwater in the Skagit River basin. The intent of this project is to fill critical information gaps in support of wetland conservation efforts in the Columbia Plateau ecoregion under a changing climate. First, this project will provide consistent, wall-to-wall data on wetland location, historical hydrologic dynamics, and projected climate change impacts on hydrologic dynamics. Secondly, this project will work with managers in using these data to develop recommendations for climate-smart conservation of wetlands across the Columbia Plateau. Through the use of global climate and regional weather models this research will provide Seattle City Light with information regarding how climate change may affect windstorm and lightning frequency in the area of western Washington containing City Light’s generation, transmission, and distribution infrastructure. This research, integrating both landslide and hydroclimate research, will develop an empirical static model and integrate it with an innovative numerical dynamic model, which will be used for regional landslide prediction. This work will aid resource management decision making and will be incorporated into K-12, undergraduate, and graduate education. This project is being developed in close collaboration with state and federal agencies, who can put the results to use in land management. The Washington Coastal Resilience Project (WCRP), a three-year effort to rapidly increase the state’s capacity to prepare for coastal hazards, such as flooding and erosion, that are related to sea level rise. The overall aim of this collaborative project is to improve risk projections, provide better guidance for land use planners and strengthen capital investment programs for coastal restoration and infrastructure. The Climate Impacts Group has partnered to produced a range of products including the Projected Sea Level Rise in Washington State – A 2018 Assessment report, Guidelines for Mapping Sea Level Rise Inundation for Washington State and Sea Level Rise Considerations for Nearshore Restoration Projects in Puget Sound. More products are currently in development. Anticipation of climate change impacts in coastal regions has elevated adaptation to climate change on the agenda of federal, state, and local policymakers. To decide on a particular course of action, and garner the necessary political and social support to commit scarce resources to climate change adaptation, resource managers and planners must define goals, assess trade-offs among different options, and agree with their stakeholders on a preferable strategy. Thus, they increasingly ask one big and difficult question: What would successful adaptation look like? This project uses a variety of research approaches to create scientifically-grounded, practice-relevant indicators and metrics of success for adaption in the coastal sector. Wildfires are a growing concern for communities, decision-makers, employers and workers across the western United States, including Washington state. Wildfires have public health consequences for populations directly in wildfire-prone areas, as well as for populations located many miles downwind due to poor air quality from wildfire smoke. While many have called for action to reduce the public health threat of wildfire smoke for affected communities, uncertainties remain around the health impacts of wildfire smoke exposure and the effectiveness of risk reduction strategies. In October 2018, the Climate Impacts Group co-hosted a Wildfire Smoke Risk Communication Stakeholder Synthesis Symposium to identify and prioritize needs, barriers, and solutions to promote effective wildfire smoke risk communication and risk reduction across Washington state. This symposium brought together 75 regional stakeholders representing over 30 agencies, organizations, communities and tribes to share lessons learned from recent wildfire seasons, to provide information on the current state of the science related to wildfire smoke exposure and health, and to facilitate collaborations between researchers and practitioners involved with wildfire smoke across the state. In recent years, concern has risen among western Washington communities about climate change and the impacts of increased wildfire risk in the region. This concern is motivated by large wildfires in eastern Washington and California, smoke events in western Washington, and growing evidence that changes in the climate are increasing the likelihood of wildfire in the Pacific Northwest. In December 2018, the Climate Impacts Group co-hosted a workshop on the risks of westside wildfire risk that was attended by about 100 people from county, state, and federal government, as well as academia, regional Tribes, and the private sector. The goals of the workshop, and the resulting products and communications materials, are to raise awareness of the risks associated with westside wildfire, facilitate peer-to-peer learning on adaptation responses, and connect practitioners and scientists to share information and identify actionable science needs. Current and future climate risks, stemming from heat waves, floods and droughts pose challenges for all Washington communities. However, the degree to which communities are exposed to climate hazards is not uniform across the state. Similarly, the extent to which communities are vulnerable to or can cope with hazards varies across communities, and even among individuals. This report aims to support ongoing discussions at the local and state levels regarding the climate risks facing communities in Washington, with a special emphasis on risks faced by communities of color, indigenous peoples and communities with lower incomes. Washington State has identified climate change as a major challenge to its economic, social, and environmental success. To take stock of state agencies’ efforts to prepare for climate impacts, the University of Washington’s Climate Impacts Group and School of Marine and Environmental Affairs reviewed publicly available online documents, administered an online survey, and convened focus group discussions involving over 60 agency staff.